It’d be comical if it wasn’t so concerning. With the frequent changes in leadership and constant mud-slinging through the media, many people tune out of daily political news. As prices fall in markets across the country, tuning out of politics is simply not an option for the astute property owner with much at stake in the coming election. Ignoring Canberra and its politics can be a costly mistake as the various proposed policy changes from both the Australian Labor Party (ALP) and The Liberal Party of Australia (Liberal) camps will make a huge impact on our property landscape – affecting home-owners and investors. The ALP unleashed a media storm when it burst out of the policy box and promised to abolish negative gearing for all properties except new housing – with a tidal wave of opposition among the investment community. Any property owner should be very concerned about this proposal and its impact on prices. Related reading: What effect does political change have on the property market? There has been considerably less attention to other significant property-related policies that ALP has tabled such as increasing capital gains tax – which could have a monumental impact on all property sales. Liberal’s policies have been deemed more investor-friendly – particularly keeping negative gearing in its current form and just removing travel expenses as a deduction. A policy already implemented. 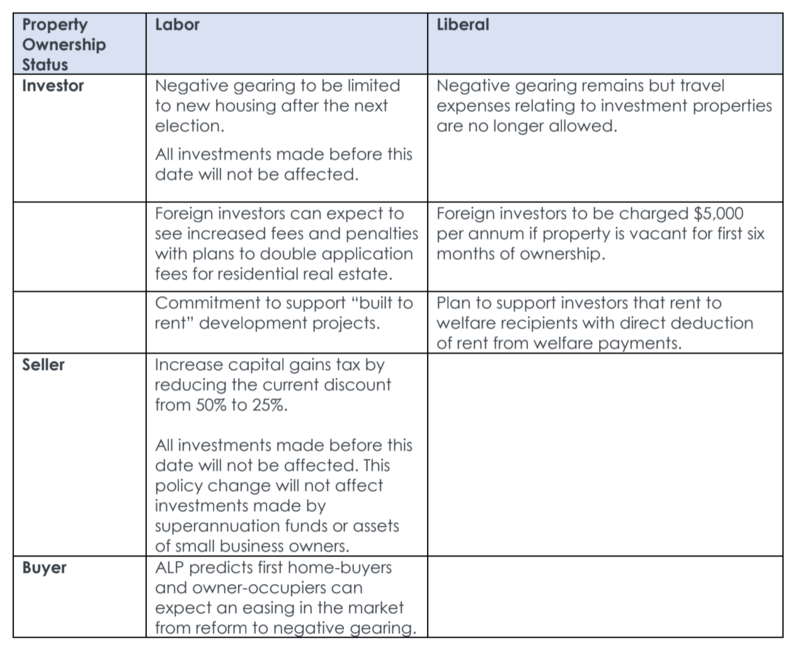 So what is best for property investors – ALP or Liberal policy? There is no blanket solution and what is best will vary depending on each individual investor’s age, retirement plans and financial position. One thing is clear – if Labor implements its new negative gearing regime – the winner will be the new housing market as any investor wanting to minimise their tax burden will snap up to new developments - new houses and new apartments. Conversely investment in existing properties will take a nosedive as it will be far less appealing with no negative gearing benefits. Prime Minister Scott Morrison has recently foreshadowed a “housing market crash” as a likely result of Labor’s property policies including abolishing negative gearing and halving the 50 per cent capital gains tax discount. With an election due by the end of May next year property investors will have greater certainty about any changes to the market. In the meantime it’s important to continue to monitor what is coming out of Canberra to ensure investors are best placed to protect and grow their portfolio. Keeping up-to-date with the proposed changes is a minefield but is best summarised in this table.